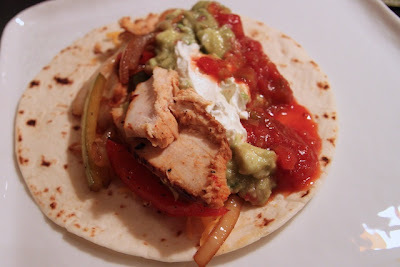 Fajitas were always one of my favorite childhood meals. We grew hopeful when avocados lingered in the fruit basket - what could become of those? "Can we have fajitas for dinner?" we'd ask Mom. "It's a lot of work!" she'd reply, fooling nobody -- we knew she lived for long days, preparing everything from scratch. Then she sequestered herself into the kitchen, mincing and chopping veggies to make homemade pico de gallo and that amazing guacamole. And when we heard the hiss of chicken hitting the grill pan, we knew fajitas were coming. Served with black beans and rice, they were the most memorable meal of many memorable meals that my mom made for us. Now I'm off on my own, and it's been years since I had Mom's fajitas. Fortunately, I can make them often: my own household loves them as much as I do. The key, I've found, is in the chicken marinade. 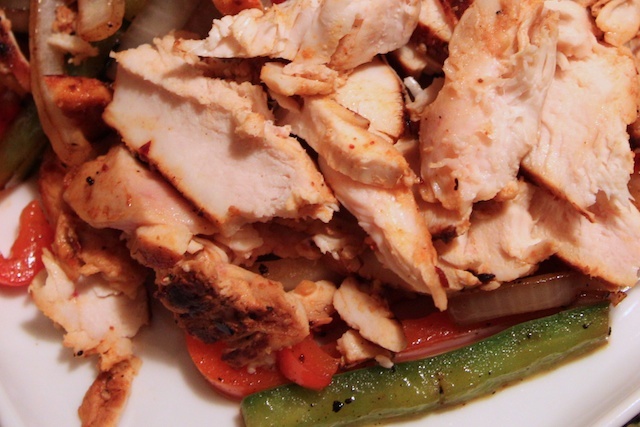 You might garnish a fajita with lots of goodies, but great chicken provides a wonderful foundation for all of them. Mom's marinade was really good -- it involved bottled Italian dressing and a whole bunch of other things. Mine started there and evolved over the years. I love to include dried chilies, which adds a smoky heat that gives the chicken incredible flavor. I also include citrus for sweet acidity, and throw in garlic and spices for flavor. Marx's puya chiles were a perfect addition to the marinade. They are smoky and spicy enough to add a real kick to the marinade. I hope you'll enjoy them as much as we did. First, make the marinade. In a small skillet, over medium-high heat, toast the Puya chilies until puffy -- just a few seconds. In a blender or food processor (I use a Magic Bullet), combine the chilies with the remaining marinade ingredients. Pulse until smooth. In a separate bowl or plastic bag, combine the marinade with the chicken. Let rest for at least a half hour, but if you want to do this in advance and really get good flavor into the chicken, you can leave it overnight until the next day's meal. When you're ready to make the fajitas, heat up a nonstick skillet over medium-high heat. (I use a cast iron skillet with great results, but you can grill it, use a grill pan, and so on). Add the chicken breasts to the hot skillet, flipping frequently until cooked through and a little charred on the outside. This is why high heat and flipping often is a good technique here: it'll help the chicken cook through quickly and stay juicy, while the outside does get some extra flavor and texture. When the chicken is done, plate it and let rest for 5-10 minutes. Meanwhile, add the peppers and onions to the still-hot pan. Do not flip or move, as you want them to char a little bit. After a couple of minutes, stir and then leave them alone for another couple of minutes. You want them a little blackened, but still crispy. Slice the chicken breasts into strips. Serve them atop the peppers and onions, with tortillas and all the garnishes you desire.